Björk is a singer known for pushing the boundaries in music, but now she's moving into the exhibition space, with a virtual reality twist, in a new show at Somerset House. The first installation is on two screens and feels more like a music video: Björk dances around on black volcanic rock, tearing off chunks of rock and beating her chest. 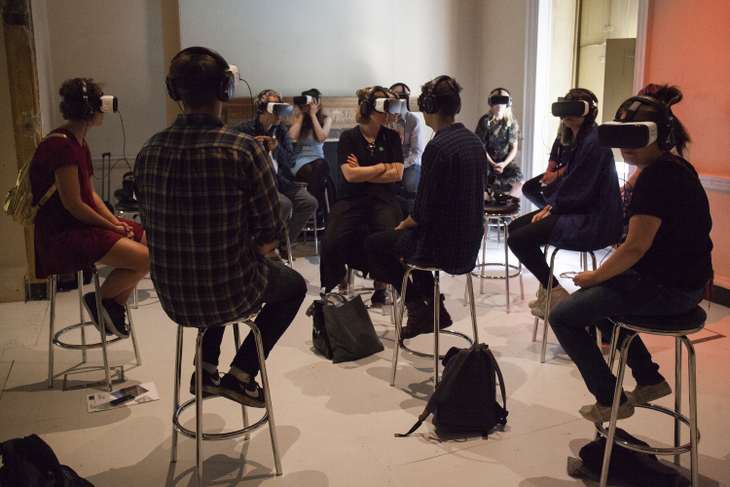 But the selling point of this show is the virtual reality experiences, and for that we're shepherded into a series of rooms where we either sit on a stool or stand in a space. In both cases we can turn around and see the world in 360 degrees. It's quite something to have multiple versions of the Icelandic megastar singing at us from all angles on a beach, especially when her face appears very close to ours. It only gets stranger from there as we watch Björk sing from inside someone else's mouth and then we walk around a multicoloured rendering of her singing. Not all music videos would benefit from a virtual reality experience, but it's the surreal nature of Björk's videos that lends itself so well to this technology. Even not being fans of Björk, we were impressed by the cinematography and the artistic style of each work. Cynics would suggest this exhibition is a plug for her new album, but it's the visuals that win here, not the music. Though we found the experience refreshing, this was largely due to the novelty factor of the mash up of music and virtual reality, rather than any particular work being especially stand out. Björk fans will love this, as will those who like their art exhibitions a little different and experimental. It's a bold concept and great to see music and art converging in a rather unorthodox fashion. It's by no means a perfect exhibition but we're hoping we get more innovative exhibitions like this one in the future. Bjork Digital is on at Somerset House until 23 October. Tickets are £15 for adults.